Think about your last couple purchases from Amazon. Maybe your cart contained a new videogame, or a wolf t-shirt, or a box of fresh Abba-zaba, or a bag of 1500 live ladybugs. There’s a lot of different stuff on Amazon and it all has to come from somewhere, like, say, massive warehouses that are so big they could hold 28 football fields. Working as a picker at one of these, having to run between chaotically-organized shelves to fulfill orders all the while being on a time limit, is a physically and mentally taxing job that many employees describe as a soul-crushing experience. Luckily, the job has become virtually non-existent thanks to hundreds of little robots by the name of Kiva, that work as a connected “fleet” to do the job quicker, more efficiently, and without the exhaustion of a human worker. This is how transportation might work in the near future. Volvo says that GPS and cameras have limitations in certain conditions, so they have created road-integrated magnets that remain unaffected by physical obstacles and poor weather conditions. When people talk about the viability of self-driving transportation, most of the time they’re thinking on a small scale—a few self-driving cars scattered among the traffic of regularly human-assisted rides. There are benefits on this scale—on an individual level autonomous cars are safer in the long run. In America alone, roughly 40,000 people are killed every year and 2 million injured by car accidents caused by human error. Meanwhile, Google’s self-driving vehicles have been on the road 700,000 times and never caused a crash. Plus, the ability to catch a few extra winks of sleep or polish off another chapter of the novel you’re reading on your way to work—without having to deal with the rush and general grossness of a public transit system—is a nice bonus. This is all good stuff, but the wider advantages of autonomous cars come when you connect them into a fleet like the Kiva robots. We’re not just talking about a fun luxury—we’re talking about a fully connected public transit ecosystem. We’re talking about replacing conventional human-operated cars entirely with a connected fleet of vehicles, all of which are collecting data every second, in order to create transportation that is more flexible and efficient than any mass transit system yet. The magnets create an invisible ‘railway’ that literally paves the way for a positioning inaccuracy of less than one decimeter. Sounds like a futuristic dream, but it’s closer than you would think. At the 2015 International Consumer Electronics Show, Mercedes-Benz’s keynote address was mostly focused on introducing an autonomous luxury car prototype; Ford followed, focusing more on the ability for these types of vehicles to offer ride-share opportunities for citizens going to the same place at the same time. 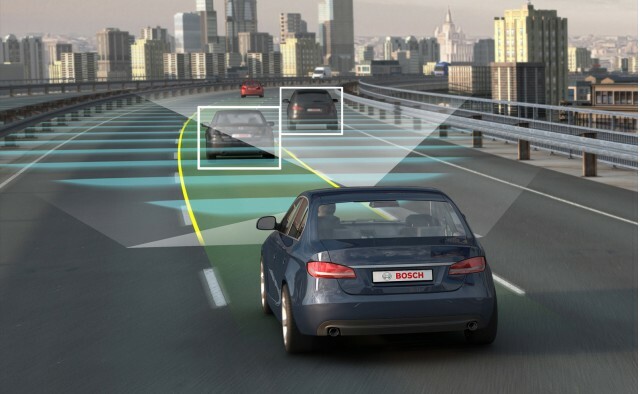 Other major car companies like Audi, Toyota, and BMW also exhibited some form of autonomy within their products, and LG Electronics focused largely on technology that connects smart devices to cars seamlessly. Meanwhile, the “Executive Grade” version of this year’s Honda CR-V comes with a feature called “Intelligent Adaptive Cruise Control” which is supposedly able to predict and react to vehicles cutting in front of you up to five seconds before it happens. And of course, there’s Google’s self-driving car, which the company expects to be available to the public in two-to-five years. The University of Michigan has even devoted some of its campus space for use as a simulated city centre for them. Once we get there, the advantages of a connected fleet replacing conventional driving are huge. The idea would be for it to take the place of public transit systems; riders would pay a specified rate to get from one place to another, and others going to the same general area would get picked up as well. It wouldn’t have to be cars specifically either; any transportation, from bikes, to cars, to buses, would work. In fact, it’s probably a combination of these things that creates the solution to our transportation woes; the autonomy is the important part. This would be effective for a few reasons. Public transit systems take forever to plan, and then even longer to construct. At the same time, since these systems take so long to build, their tech and architecture are severely out-of-date by the time they’re complete. And they’re expensive as hell to both the city and the riders, both in regards to initial construction and daily operation. New Yorkers might like to tout that their subway only costs $2.50, but that doesn’t include the taxes and subsidies that every citizen pays to keep it operating at 6 billion dollars a year. An autonomous fleet solves basically all of these issues. Car companies are already really good at pumping out large amounts of vehicles, and the fleet would require them to manufacture fewer cars than they do now. Tech could stay up-to-date through online updates, and car dealerships could simply turn their focus towards service rather than sales, keeping the vehicles mechanically sound. When it comes to cost, riders would probably pay by a per-mile fee for the exact distance of their trip—much cheaper than the various facets of car ownership or the fixed price of public transit—and governments would save tons of money that they no longer had to burn on things like subway upkeep. That’s in addition to the estimated 871 billion dollars that America spends due to motor vehicle crashes every year, which would be severely lessened due to the increased safety of autonomous machines. It’s probably a ways off until these cars become fully connected with each other, and even longer until the average person is willing to give up their own individual car—it’s been almost a century of the North American advertising machine feeding people the idea that the ability to drive independently is equated with “freedom,” and it’s going to take a while for that stigma to shake off. There’s also the subject of “car people”; I am not one of these, but I know many who have cars tied to their very identity, and I understand. But for the rest of us, personally I can’t wait until I no longer have to fight for an uncomfortable seat in a dirty, cramped, smelly subway car so that I can take a nap on my way home from work.